Disclaimer: I actually read two stories and had two different beers on this outing, the other story being Bradbury’s “The Exiles” and the other beer being Confessional IPA from St. Joseph Brewing Co. I’d read the story before (even blogged about it here) so I won’t include it in this post, and though Confessional IPA is a decent brew, it is imho inferior to “Nat Lib,” which is one of my favorite local beers. 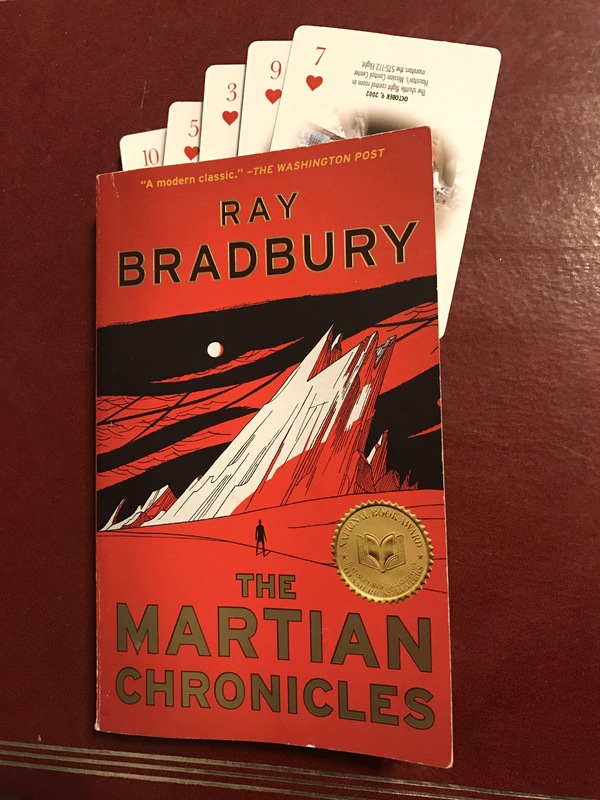 I’m in the process of cleaning up the unread “orphan stories” that I didn’t finish as part of my #24in48 Readathon plans, and the next card I drew was the four of Clubs, to which I had assigned the story “The Dragon” from my copy of Bradbury Stories: 100 of his Most Celebrated Tales. It was originally published in 1955 in Esquire Magazine. This story wouldn’t deliver the goods if these two brave souls didn’t indeed encounter the dragon they seek, but is it one of their time, or another? Will they vanquish it, or will their bodies be left strewn in its wake, as countless others have been? I really enjoyed this story and was once again amazed at how some authors can tell such a great story in so few pages. I tried to stop and tweet about my reading in the breaks between stories and I believe I sent out between 40-50 Tweets, and received 169 “likes” on them. I gained six Twitter followers during the readathon. 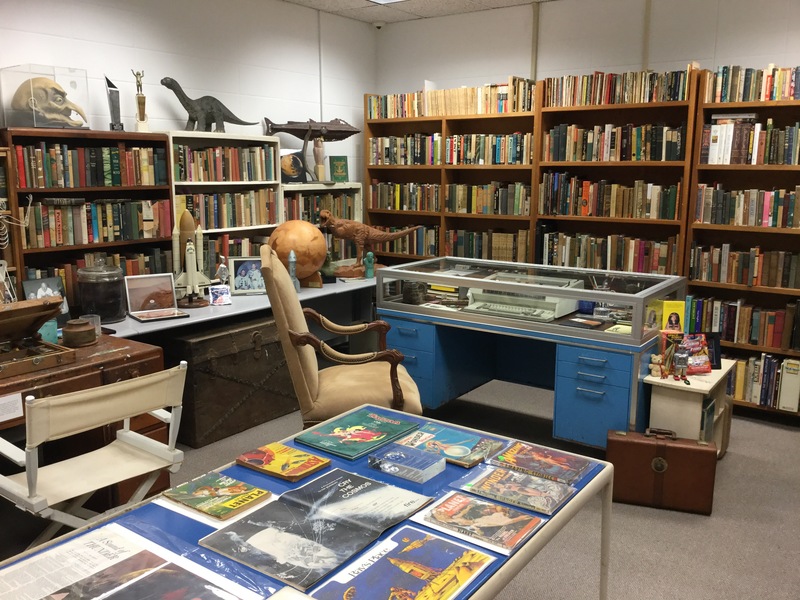 The Center for Ray Bradbury Studies gained eight “likes” on Facebook during the readathon, though I couldn’t prove if all (or any, frankly) were due to my tweeting and blogging about it. How many books did you read? Pages? (If you didn’t keep track, tell me that too!) I read short stories instead of books and finished 28 of them. 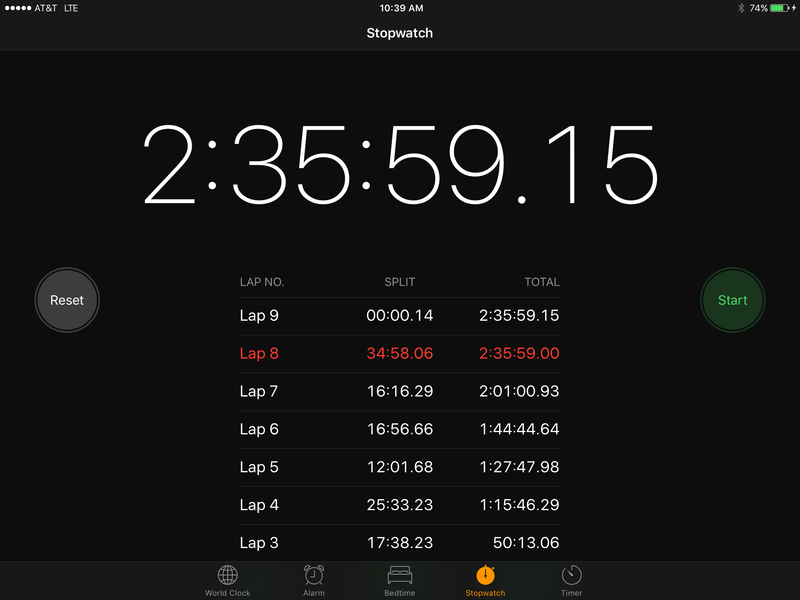 A record for me during a #24in48 readathon – the last few #24in48 readathons, I’ve read my goal of 24 short stories rather than 24 hours. I didn’t keep track of pages read – I’m such a slow reader that it’s too depressing to do that. I’d estimate 400-450 pages, though. What do you think worked well in this readathon? Reading short stories gave me natural breaks, as only a few took me longer than 30 minutes to read. During the breaks I would tweet a couple times and try to like and comment on other ‘thon’ers tweets. This part of the readathon was a lot of fun. What do you think could be done to improve the readathon for next time? Seems pretty good as it is, to me! 🙂 I wish I weren’t such a slow reader, but that happens with me every readathon. 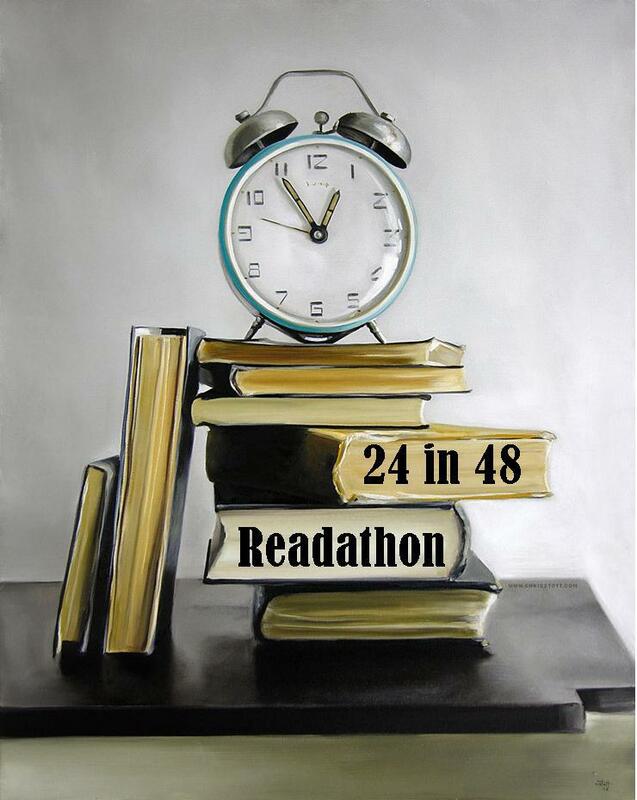 Will you participate in a future 24in48 readathon? Yes, I am looking forward to it already! Progress: okay, I got off to a much slower start than I hoped, having decided I should at least put in an appearance at my brother’s birthday party. I got home about 9:45 (I decided to used GMT for my time zone for this readathon, so that means I official started at 8pm here) and hoped to read for at least awhile, but didn’t last too long before ISP started drifting off. I decided to let sleep happen (like I have a choice!) and just hit the ground running this morning, which I did. Immediately getting started by reading a couple stories in bed before I got up. Then it was off to Panera for coffee and breakfast where, for once, no one was in “my spot” and I read pretty solidly untila bout 10:30. At that point I’d read nine of my intended fifty-two stories and drew my card for the tenth one. Time: I’m averaging around a twenty minutes a story I guess, which means it’s theoretically possible I complete all fifty two during the readathon, but we’ll see. It seems appropriate to use a space travel-related deck of cards, so I opted for this “Space Center” deck. 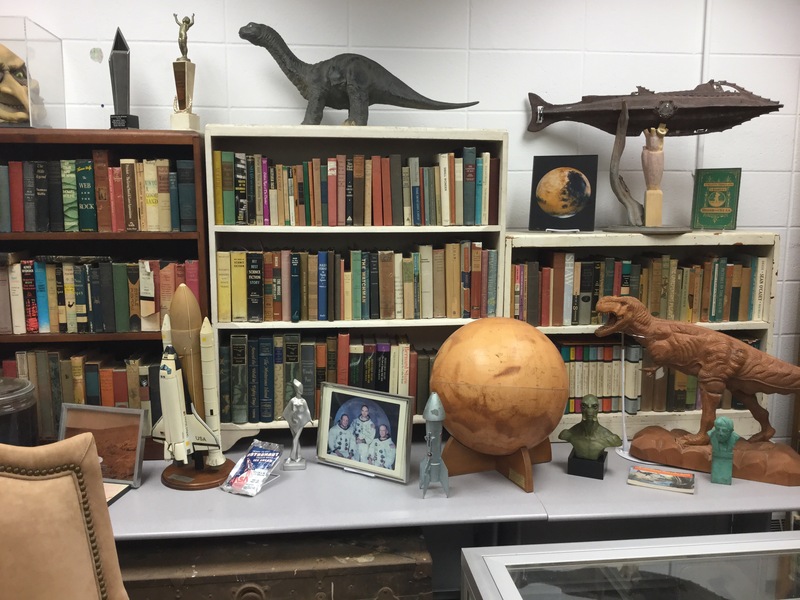 Favorites: It’s odd that random chance thus far has front loaded my stories from The Martian Chronicles. Maybe Fate knows how much I liked that book and wanted to start men out with more favorites. There’s something about “There Will Come Soft Rains” that really gets to me. Something about an “automated” house outliving its creators yet eventually falling victim itself to “The Forces of Nature” that activates my “sympathy subroutine” – and the inclusion of the poem by Teasdale is perfect in this story. A couple stories examined religious themes too,especially “The Man” which I don’t think I’ve ever read before. It offers a somewhat damn good view of humanity – or at least some of its members. Up Next: I’ve adjourned to the Indiana State Library in downtown Indy – a favorite weekend reading/working spot and am going to try to read for the next three hours straight. Follow my progress on Twitter (@Bibliophilopoly) and let me know how you’re doing as well. The time is nigh for the start of the Bi-annual #24in48 Readathon! What is the #24in48 Readathon? My Plans – and a Giveaway! I will try to post here at Bibliophilopolis several times during the weekend, and certainly plan to tweet often about what story I’m on or have just finished, and what I think of it. I plan to do a giveaway at the end of the #24in48 challenge, and anyone who comments or likes a blog post – including this one! – or who replies or likes or retweets one of my tweets, will be entered into a drawing (and yes, if you like/comment/reply/retweet multiple posts or tweets, you will be entered multiple times – limit of one per post/tweet, though), the winner receiving their choice among several books by Bradbury – some in hardcover. (I’ll share what the prize options in an upcoming blog post) ALSO – If you share in your comment or reply that you have liked or followed their Facebook page, you will be entered into the drawing twice. Lets see if we can make a modest impact to their total likes tally! The winner will be notified via the same media “channel” (WordPress or Twitter) which they used to earn their entry. 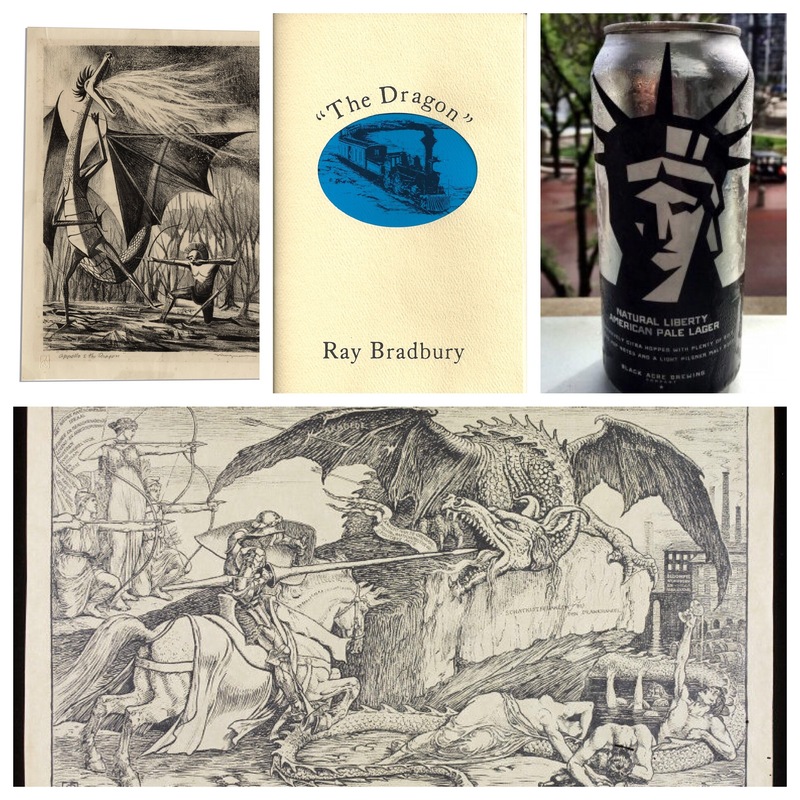 ♦♦♦Diamonds♦♦♦ = “The Director’s Cut” – Stories recommended by the Director of The Center for Ray Bradbury Studies at IUPUI, Jon Eller. 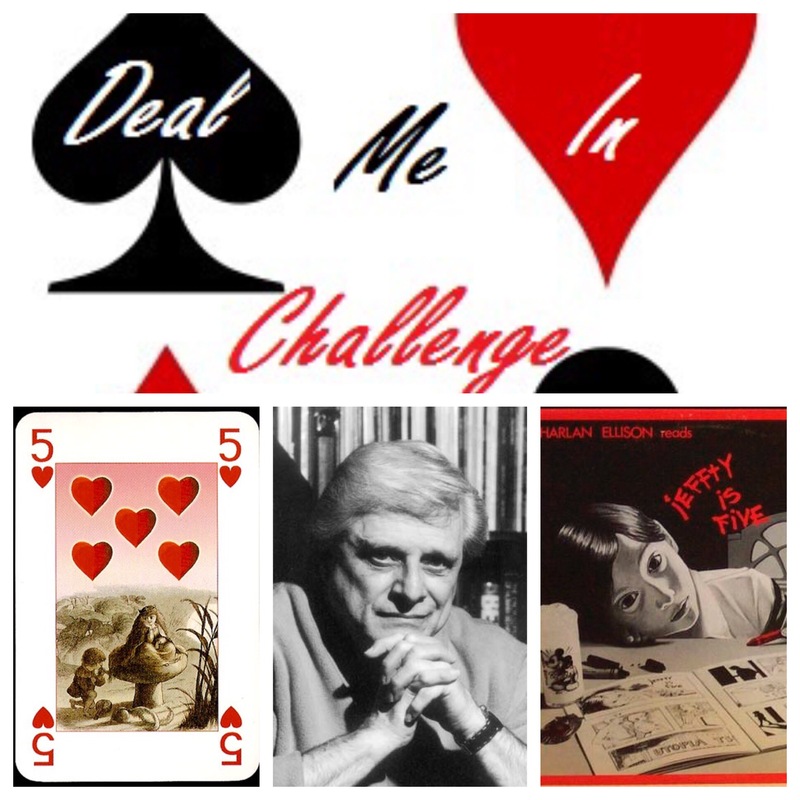 ♠♠♠Spades♠♠♠ = Stories from “The Illustrated Man” or “Quicker Than the Eye” collections. Any of these stories marked by an asterisk were also recommended by my fellow book bloggers. The Author: Gertrude Stein – Born in Pittsburgh, but spending most of her life in Paris and was famous for her being a part of a circle of Lost Generation-y luminaries including Hemingway, Fitzgerald and Picasso to name just a few. This essay was my 27th Selection of Deal Me In 2017. 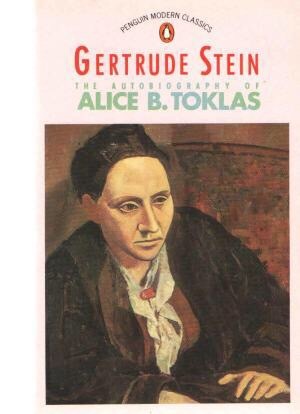 ♫♫ Personal Notes: I think I read a little of Stein before, as I was forced to read (or was at least supposed to read) her “Autobiography of Alice B. Toklas” in college. I likely abandoned that attempt too if it was anything like this one. And how’s that for pretentious, by the way, writing someone else’s autobiography!? What about you? 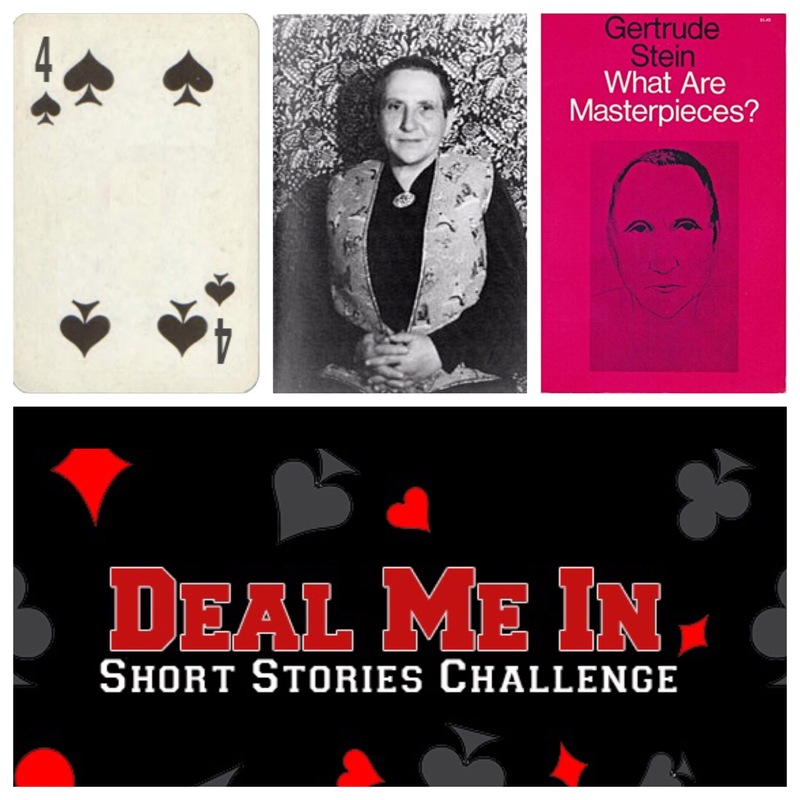 Can you help me “get” Gertrude Stein? What am I missing? Re-blogging this today, as it is the anniversary of Professor Campbell’s death and no doubt many of this blog’s followers have signed on since its first appearance. The Card: ♥5♥ Five of Hearts (image from playingcardcollector.net) Honestly, it was not intentional that I assigned this story to a “5” card, just a happy coincidence. 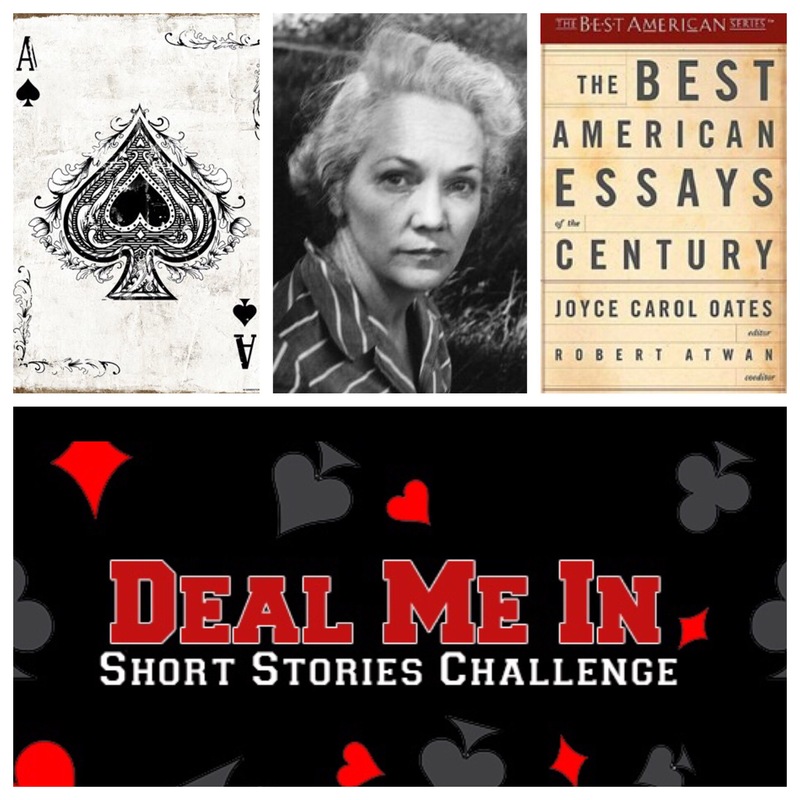 The Suit: For my version of Deal Me IN, this year, Hearts is the domain of Atropos, one of the “Fates” from Classical Greek Mythology who “sang of things that are yet to be” i.e., things in the future – the setting for this story. Atropos is also frequently represented as holding a pair of scissors with which she snips the thread of life which is spun by her two sisters, Clotho and Lachesis. The Selection: “Jeffry is Five” – First published in 1977 in The Magazine of Fantasy and Science Fiction thus not surprisingly included my copy of The Very Best of Fantasy and Science Fiction volume 2. I’ve always had a fondness for stories that play around with time. (I’m actually reading one right now – Jack Finney’s Time and Again). Vonnegut’s most famous protagonist – Billy Pilgrim if I have to tell you! – is just that because he becomes “Unstuck in Time.” F. Scott Fitzgerald’s Benjamin Button puts a different spin on time, aging “backwards” after having been born an old man. There are other stories of those whose time is accelerated somehow, but what of Jeffty in this story? What’s his temporal oddity? What can we learn from a five year old about time? Pretty much, it turns out, because not only is Jeffty five. He’s always five. We learn this from our narrator, Donny, who, though he has now grown up, was once five together with Jeffty, enjoying all that the magic of the world and the friendship of that age has to offer. Of all the characters in the story – even Jeffty’s parents – Donny is the one person who remains close to Jeffty, somehow appreciating him in spite of his oddity. How does Jeffty remain always five? It seems this is partly achieved by his somehow being able to tune in to “live” radio shows that are no longer in production. At one point in the story Donny finds, for example, that Jeffty has a brand new decoder badge from the Captain Midnight radio program. That program has been off the air for twenty years, so how did Jeffty get this new “merch?” He simply “sent away for it,” apparently. The Suit: For this year’s Deal Me IN, the suit of Spades is the domain of Clotho, one of the Fates from Greek Mythology who, according to Plato’s sings of things that are (i.e. the “present” for Deal Me In purposes). This story’s title meant I could probably put it with Fate representing the present or future. I went with the present. 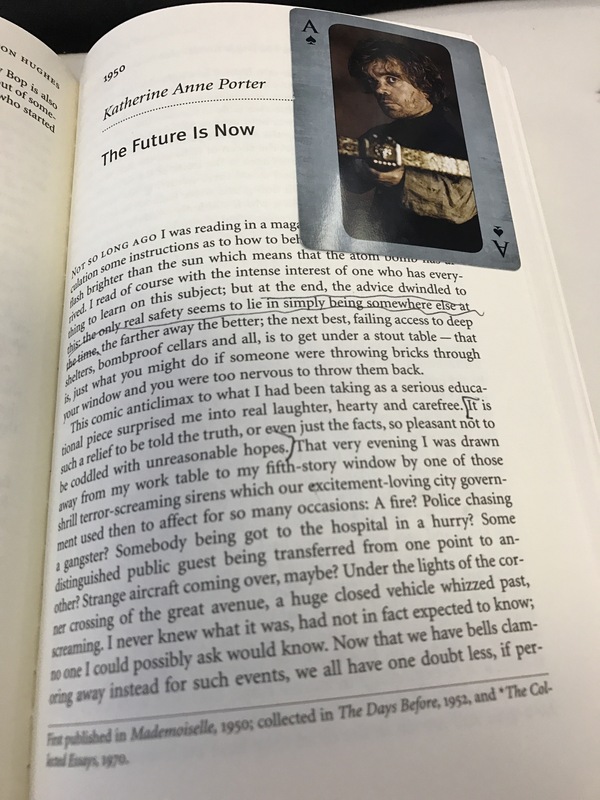 The Selection: “The Future is Now” – published in 1950 and included my copy of The Best American Essays of the Century” edited by Joyce Carol Oates. I found a google docs pdf copy of the essay online here. The Author: Katherine Anne Porter – Born in Texas in 1890 and famous for her novel “Ship of Fools” and countless stories and essays. She’s been featured at Bibliophilopolis before, and my post about her short story “Theft” remains one of my more frequently visited pages. I never fail to be impressed by writing that “holds up” over the years and can still read as relevant in a totally different time and circumstance. Porter’s essay, “The Future is Now” is a good example. Written in 1950, it expresses legitimate concern about the future of humanity and shows how these thoughts are almost always with us. This essay was written by Porter shortly after her having read an article about what to do in case of a nuclear attack – something that was starting to worry many at that point in history – and the futility in trying to prepare for one (see the underlined sentence in the photo above). Apparently, the testing of first Hydrogen Bomb was also eminent, and Porter had this in mind as well, leading to this essay also musing about the status of the human race and it’s love-hate relationship with technology. I heartily recommend reading this essay (link given in the intro) to anyone in any time period (that sounds funny when I put it that way – what can someone of the 19th century do about it? – but I hope you understand what I mean). Personally, I choose to be hopeful in a world that often doesn’t seem to offer much hope for the future. Porter seems to choose hope as well, which is why I used the quote I did as the lead in above. The Suit: For this year’s Deal Me IN, the suit of Hearts is the domain of Atropos, one of the Fates from Greek Mythology who, according to Plato, sings of things that are to be (i.e. the “future” for Deal Me In purposes). This story is set in a distant future where human physiology has been enhanced by the incorporation of machines. The Selection: “The People of Sand and Slag” was originally published in 2004 and was a nominee for the Hugo and Nebula awards for best novelette. I own it as part of the anthology The Very Best of Science Fiction and Fantasy, Volume 2. This was a wild card selection and I picked it because it was in a source I was already using for Deal Me In 2017 and because I had read the author’s novel “The Windup Girl” last year. This story may be read online at the author’s website. 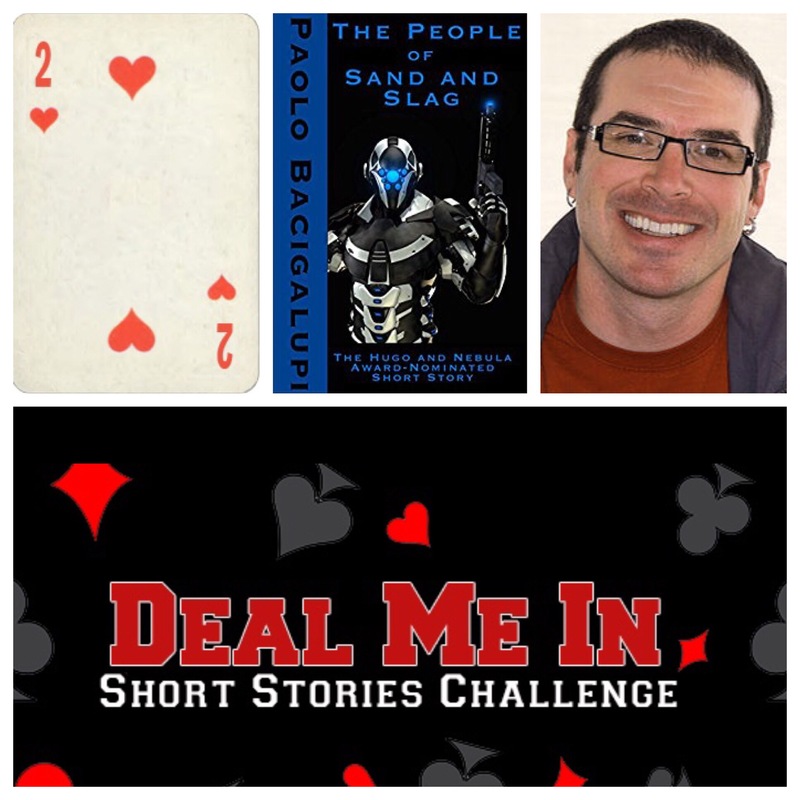 The Author: Paolo Bacigalupi – A Colorado writer most famous for his novel, The Windup Girl, which was named by Time as one of the top ten books of 2009. Learn more about him at his website. I don’t know how much more dystopian you can get than a world where there are no longer dogs, or at least one where they’re so rare that hardly anyone has ever seen one. 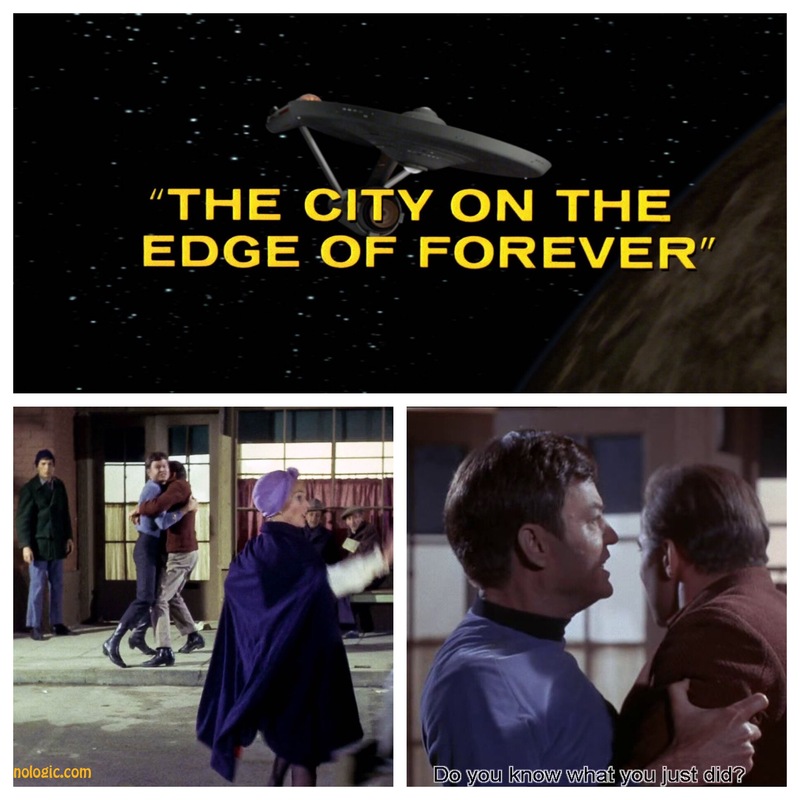 Such a world, however, is inhabited by Jaak, Lisa, and Chen – three security-guard types who, at the onset of this story, are sent off to intercept and eliminate the source of “hostile movement” within the corporate boundaries of “SesCo’s” mining operations. But what would three bio-engineered, machine-enhanced humans of the future do with a dog? Lisa laughs that “It’s hard to believe we ever lived to evolve out that. If you chop off its legs, they won’t regrow.” (Lisa’s broken femur from the team’s “helo-casting” into the slag pits already having healed.). The company flies in a biologist (“You mean a bio-engineer.” “Nope. Biologist …they study animals”) to take a look at it. He confirms authoritatively that it is indeed a dog, and the team are surprised that he doesn’t want to take it with him. One member of the team wants to eat it. One wants to keep it. All are worried about the hassle of taking care of it and providing for it. Food, for instance, is an issue. These humans can eat rock and sand, which provide all the “nutrients” their types of bodies require (“Who needs animals if you can eat stone?”). What will become of this poor creature while under the “care” of its new masters? You’ll have to read the story yourself to find out the rest. As I mentioned in the intro, I also read Bacigulapi’s novel “The Windup Girl” last year and, while I didn’t quite connect as much as I hoped to, I found it – and it’s own dystopian future – quite interesting.